At monday.com, we offer both import and export Excel functionalities. 🎉 Keep reading to learn how it works! Import from Excel is now here! With just a simple upload you can turn your Excel spreadsheets into a beautiful board in just a few steps. Click on your avatar located on the upper right corner of your screen and select "import". In the "Import Data" page, select Excel. Next you will have the ability to customize your new board this will allow you to manually control the board layout. or "Upload file again." Select your column types. The System will suggest column types for you, you can manually change this by clicking the drop down menu. Select "Create Board" and you have your new board! Note: When selecting the Header and First column, everything to the left and above the selections will not be included in your board. Click the Hamburger Menu Icon (3 lines) on the upper right hand side of the board. Then choose Export to Excel and that's it! Note: Currently, you can export one board at a time, but not yet multiple boards. We are working on this, so stay tuned! Click on the pulse you'd like to export to Excel and then click the Hamburger Menu Icon (3 lines) on the upper right hand side of the pulse. Then choose Export to Excel and that's it! 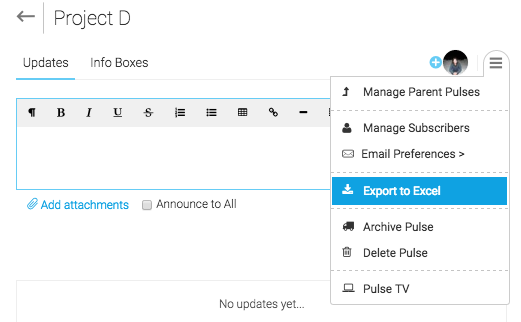 Export multiple pulses at once! Hover over the color line of one of the pulses you'd like to export. Use the boxes to select the pulses you'd like to export. Click on "Export", and you'll be able to export to Excel all the pulses selected! To learn more about internal integrations, feel free to check out this article. How to import data from Excel into an existing board? To import data from Excel into an existing board, you can use the "add heaps of pulses" feature. In one click, you will be able to paste a list in Excel into your existing board as new pulses. If you require further support to migrate your data we do have an option for paid assistance through our network of certified monday.com partners. If you're interested, please fill out this form and someone will be in touch shortly! For any further questions, don't hesitate to reach out to our customer success team right here. We are available 24/7!